On Saturday, March 5, Matthew Sackstein became a Bar Mitzvah and honored living rescuer Knud Christiansen by participating in the JFR’s Bar/Bat Mitzvah program. Matthew participated in the JFR’s invitation program, where each guest received a specialized invitation that honored Knud Christiansen’s legacy and explained the mission of the JFR. More information about the JFR’s Bar/Bat Mitzvah program can be found here. 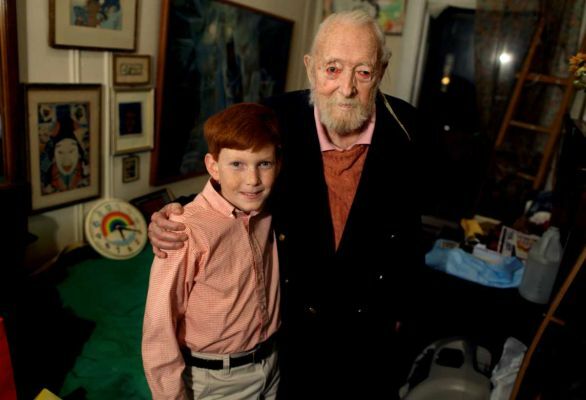 Matthew also had the rare privilege of meeting Knud prior to his Bar Mitzvah, which was very meaningful for Matthew and his family. Matthew Sackstein and rescuer Knud Christiansen, meeting before Matthew's Bar Mitzvah. The story was also featured in Newsday, where Matthew’s participation in the JFR Bar/Bat Mitzvah program and his meeting with Knud were highlighted. Read the story here.